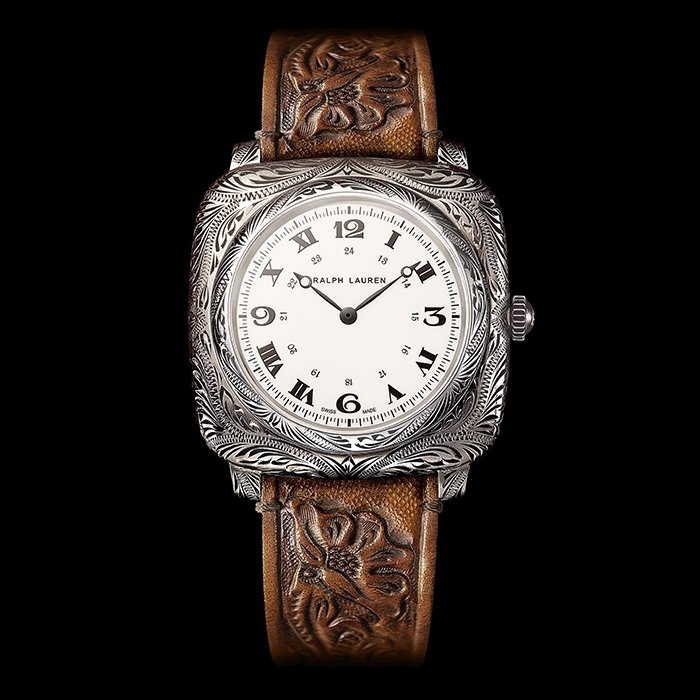 Each watch captures the authentic spirit and individual character of the vintage rodeo and concho belts Mr Lauren wears, which often influence his designs—from his first Santa Fe-inspired women’s runway in the 1980s to the belts, bags, and small leather goods at the core of his men’s Double RL accessories today. For this collection, Mr Lauren reimagines the organic motifs traditional to Western belts across a range of timepiece silhouettes, including pocket watch and cushion models, rendered in antiqued sterling silver, antiqued 18K rose gold, and burnished vachetta leather. 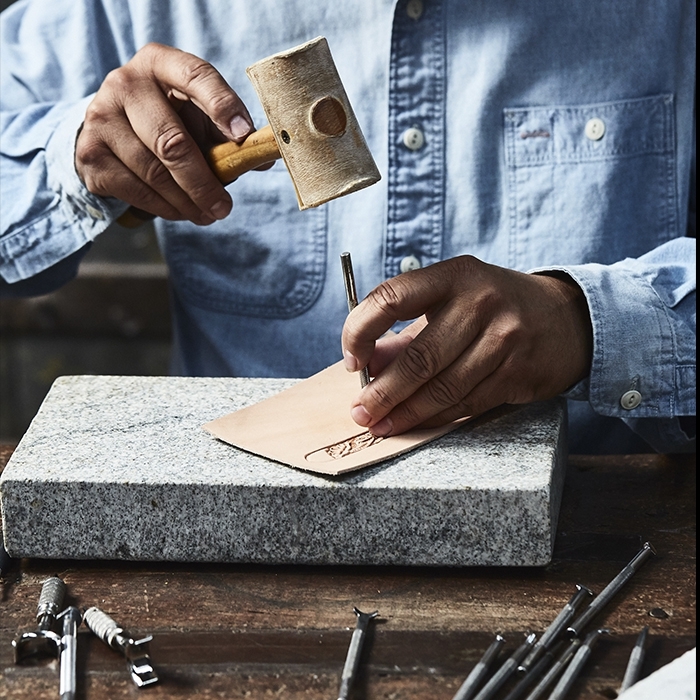 Ralph Lauren partnered with master artisans across the world uniquely qualified to achieve the highest quality and authenticity in each element of the design. The leather straps are hand-tooled in Texas and burnished in Italy, while the metal cases and buckles are hand-engraved and aged in New York City—all in complement to Swiss-made movements. 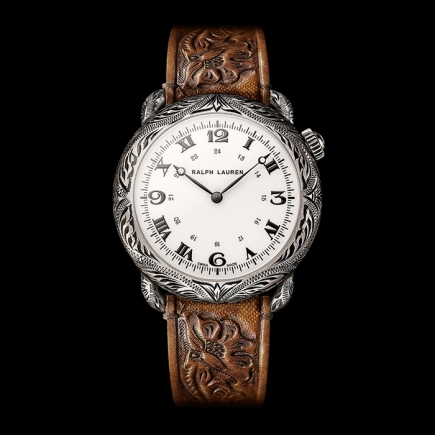 Subtle differences, in the weight of engraving strokes or patina of the metals, are inherent to the watches, making each a one-of-a-kind expression of Ralph Lauren’s commitment to the ultimate craftsmanship. A refined shape evocative of the 1930s and `40s, the cushion case measures 42mm by 10.6mm and is powered by a mechanical movement made by Piaget for Ralph Lauren. The same self-winding calibre RL514 is found in the round model, which measures 45.8mm by 11.24mm and is likewise available in antiqued silver or gold with interchangeable straps. The entire collection is accented with vintage-inspired off-white dials hand-printed with Roman and Arabic numerals, a combination distinctive to the Ralph Lauren brand, and completed with Breguet-style hands. 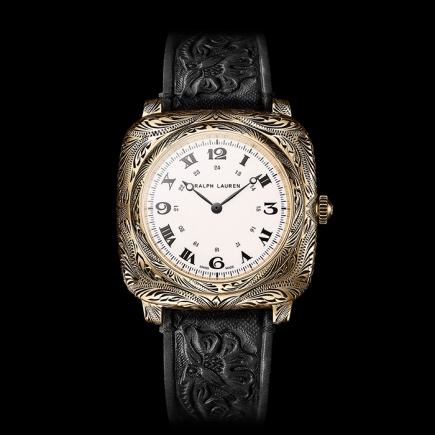 The round watch case also serves as a unique facet of the collection: the RL Western Round Skeleton. The Swiss-made calibre RL98295 continues in the tradition of the open-worked, hand-wound mechanical movement originally presented in the RL Automotive Collection—yet it is distinct here with the addition of engraving on the main bridges and base plate in the same motifs as the case. This new Skeleton brings together the graceful power of intricate mechanics with the beauty of Western design, a tribute to Ralph Lauren’s passion for time-honoured Americana and Swiss precision. The collection concludes with rarified collector’s pieces in two distinct pocket watch models powered by a mechanical manual-winding calibre RL98295. The first model is offered in 18K antiqued rose gold in an open-dial case measuring 50mm by 11.4mm and engraved with the same motifs as the cushion and round wrist watches. The most exclusive piece in the collection, of which only 50 will be produced worldwide, the second model in sterling silver is a full hunter pocket watch with a 50mm by 14mm case. The cover features a unique floral motif incorporating two types of engraving techniques and is finished with an antiqued gold RL logo and steer head detail. The head is cast from a hand-carved mould and set with ruby eyes—a final allusion to the artistry of vintage Western rodeo buckles. Powering the collection’s cushion and round models, the self-winding calibre RL514 runs at a frequency of 21,600 vibrations per hour, featuring 26 jewels with an approximately 40-hour power reserve. 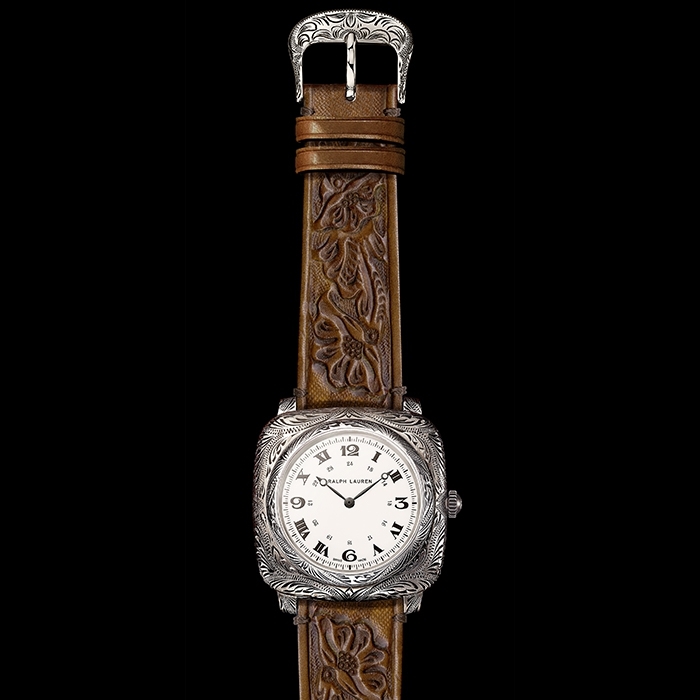 The movement is decorated with vertical Côtes de Genève stripes and circular graining, known as perlage. The calibre RL98295 (powering both pocket watches) and the calibre RL1967 (featured in the round skeleton) manual-winding movements run at a frequency of 18,000 vibrations per hour and feature 18 jewels with an approximate power reserve of 45 hours. 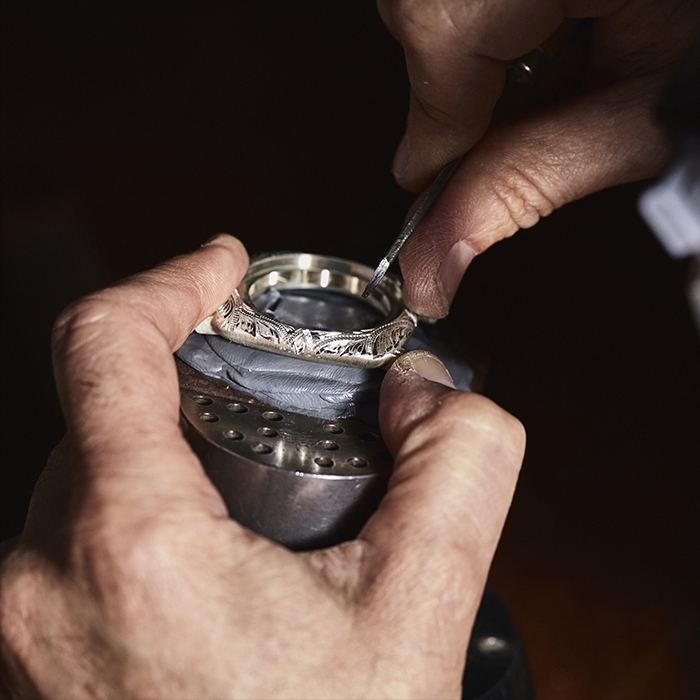 Launched in 2008, Ralph Lauren Watches and Fine Jewelry was created in partnership with Richemont, bringing together two leading companies in the global luxury market. 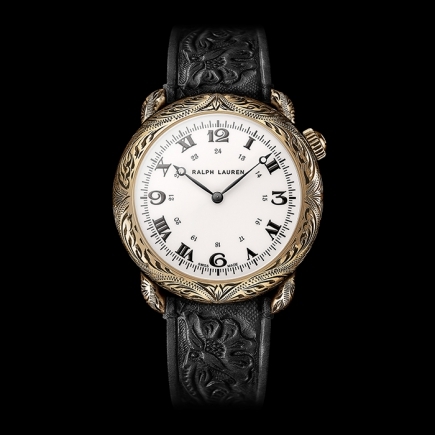 In this unique partnership, Ralph Lauren designs manufactures and distributes luxury watches and fine jewellery through select Ralph Lauren boutiques and the finest independent watch and jewellery retailers worldwide.